About nine months ago I found Gypsy at the Humane Society, she was found as a stray. She looked quite different from other cats as well as her personality. Out of curiosity I was wondering if anyone had any opinions on the possible type of breed. In my opinion she looks like a Lynx Tabby Colorpoint. Her eyes are blue and she has the M on her forehead with the same on her ears. The Humane Society just listed her breed as Siamese mix. She is such a sweetheart! Hi Lindsay and thank you for your photo of Gypsy. She's adorable! In my opinion the Humane Society were correct to list her as a Siamese mix, as without proper papers it isn't possible to tell whether a cat like Gypsy is a full Siamese or not. However, all cats with this coloring and blue eyes will have at least some Siamese genes, and you are right that she is a Lynx (Tabby) Point. It's difficult to tell from the photo whether she's a Seal or Blue Lynx Point (in the picture she looks more like a Blue), but if anyone has any opinions on this, do join in! Darla - what color am I? Comments for What Breed Do I Look Like? We adopted our girl, Pandora, from our local humane society. They thought she was a tortie point Siamese or a snowy Bengal. We are not sure which, is there any way to tell? Your cat looks like a lilac lynx point Siamese.. I have one of my own and she is very vocal. Hi there ... your Gypsy looks like a lilac lynx point. They're very affectionate cats and usually have a lot to say. I have one and love him to bits. His favorite place is on my left shoulder, nibbling on my ear lobe. Enjoy Gypsy ... she'll probably live to be a right old age if she's careful. 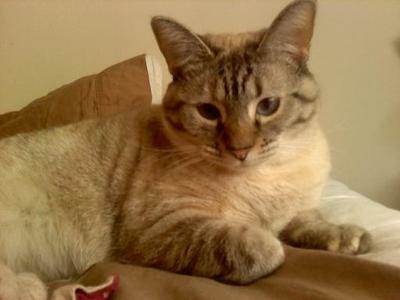 You do have a lynx point Siamese. She will darken as she gets older. My little lynx is now a little over a year old and he was as light as her when I got him at 5 months. Now he has darkened into the seal coloring (still showing lynx points). I have been told Siamese can take up to 2 years to develop their full color and points. Your cat looks like a Bengal crossed with a domestic cat, either by one or two generations.